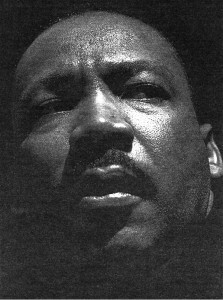 Detroit celebrates Dr. Martin Luther King, Jr.
Detroit, Mich.—On Jan. 21 several hundred people came to the 16th Annual Martin Luther King Day Rally in zero degree weather and snow-clogged streets. There was no march this year! Speakers provided warm energy. Autoworker Sean Crawford reminded everyone that an entire immigrant neighborhood in Detroit was flattened in 1980 for General Motors (GM) to build an automobile plant. The promised 6,000 jobs never materialized and 1,400 workers will lose their jobs when GM closes the “Poletown” plant. He emphasized the need for solidarity and class consciousness. Narrow nationalism allows corporations to pit us against each other, to them we are all the same. Since capitalism is international, “only international solidarity can beat corporate greed.” He called for all workers to unite in a general strike. A community takeover of plants would create good union jobs and other benefits for workers. With a community takeover, Detroit could become the leader of a Green New Deal. Jonathan Roberts, a young housing activist, discussed a lawsuit against Detroit and Wayne County opposing the auctioning of 1,500 occupied tax-foreclosed homes in Detroit, and against their misuse of Federal “Hardest Hit” funds to demolish abandoned houses—instead of using the funds to keep people in their homes. While the day’s event was largely a group of Leftists “preaching to the choir,” it is important to take seriously how people are thinking in the context of rising hatred, bigotry and military conflict. It is encouraging to hear how activists are connecting so much of what we oppose, but disheartening that there is not an ongoing coalition of activity and discussion all year. It is great to bring up class solidarity and critique capitalism, but we need to remember that the original New Deal was invented by the ruling class to stop a growing momentum for a much more radical, deeper revolutionary change in the 1930s. Is the Green New Deal any different? I would like to know what readers think. This entry was posted in Alerts & Appeals, Articles and tagged Black liberation, Detroit, Dr. Martin Luther King Jr., Elena Herrada, Gail Walker, GM, Green New Deal, housing, Jonathan Roberts, labor, Michigan, Sean Crawford, Susan Van Gelder. Bookmark the permalink.